The Joys of Photographic Waybacking | Analyze the Data not the Drivel. Remember Mr. Peabody’s Wayback Machine. Mr Peabody was dog, with a pet boy Sherman, that used his Wayback time travel machine to visit the past. I’m not sure if he ever visited the future; that’s a question best left to Rocky and Bullwinkle historians. Well, I have Wayback machines; they’re called film and flatbed scanners. I spend way to much time scanning and restoring old photographs. Over the years I’ve scanned thousands of images. It only takes a few minutes to get a high quality scan but it can take days of image editing to restore old damaged originals. Hence, I always have a backlog of scanned pictures to fix. My enthusiasm for this endless task waxes and wanes with my general photographic energies. A few weeks ago I upgraded my arsenal of DLSR cameras and lenses. New lenses always give me boast. So lately I’ve been out pixel harvesting with a lovely little f2.8 macro lens. I think she I will be an item for years to come — wide open her bokeh is beautiful. While I enjoy working with my spanking new crystal clear digital images I often find myself wandering in my vast image file directories and picking out old scans to work on. 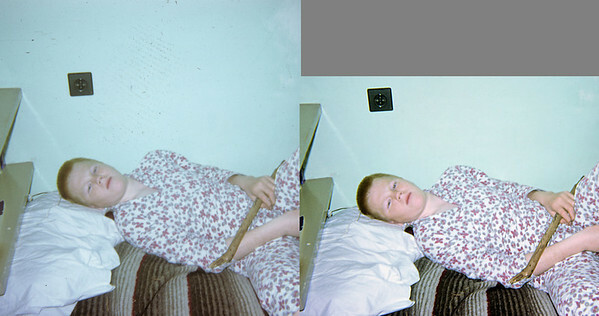 Today I whiled away a rainy afternoon restoring pictures I took over forty years ago. Here’s a shot from my ACS Beirut Lebanon boarding school days. This is from an old Instamatic camera. I believe it was my second camera. Over the years my cameras have gotten better and better but they still cannot go Wayback in time. Lying on my bed and trying to look tough for the camera. I don’t think the pajamas are helping. This image is from an old Kodacolor Instamatic slide taken in 1968. In the original scan fingerprints are visible. I take good care of originals but accidents happen. For more before-after diptychs click. This entry was posted in Diary, Image Processing, Nostalgia, Photography, Restoration and tagged ACS, Beirut, Instamatic, Lebanon, Photography, Restoration by John Baker. Bookmark the permalink. Pingback: More Photographic Waybacking | Analyze the Data not the Drivel.